A pair of breeding Kiwi introduced eight months ago to a remote valley overlooking Milford Sound are plump, happy and thriving, thanks to a joint project to establish a sanctuary for native species alongside New Zealand’s most photographed mountain. Sinbad Gully, at the base of the world-renowned Mitre Peak, has been the focus of attention for the past two years in a joint project between Southern Discoveries, the Department of Conservation (DOC) and the Fiordland Conservation Trust. Each year Southern Discoveries has made a substantial annual donation to establish a pest control programme to enable threatened birds, lizards and invertebrate species to increase in number in this beautiful area of New Zealand. Rats, stoats, mice and possums had made the area their home before Southern Discoveries’ sponsorship enabled DOC and the Trust to establish the exciting project. 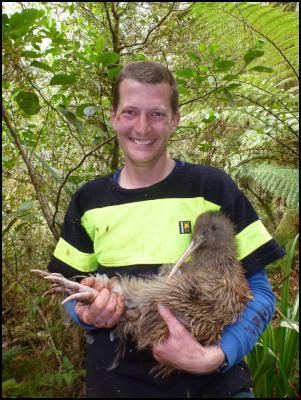 The two Kiwi, released into a suitable valley in Sinbad Gully in early February this year, are a living embodiment of the success of the project, according to DOC. Te Anau DOC Biodiversity Ranger Hannah Edmonds said the birds were “a picture of health” and looking very happy in their new home. She said the nocturnal pair were doing so well, and numbers of pests caught in traps had decreased so significantly over the past two years, that DOC was happy to free them from their transmitters and leave them to ‘go about their business’. “We’ve been working with Southern Discoveries and monitoring them since their release, and now it’s time for us to let them do their own thing,” she said. Ms Edmonds said the fact that the Kiwi were found together on the latest visit was a great sign for potential breeding. “It’s a bit too early for brood patches to be around, the patch of featherless skin that’s visible on the underside of birds during the nesting season, but we did find them in the same roost site so it’s safe to assume they’re a breeding pair,” she said. “We’ve not caught any stoats and the low numbers of pests caught overall is a good sign,” said Ms Edmonds. Southern Discoveries’ General Manager John Robson said the company was “absolutely thrilled” with the success of the conservation project to date. 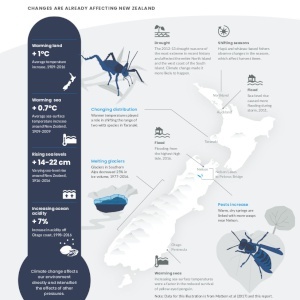 “It’s hugely rewarding for us to have worked alongside DOC and the Trust and reduced the pest population to such a degree, even though it’s still early days, that two Kiwi are thriving in the valley and we can look forward to seeing them produce chicks,” he said. Ms Edmonds said DOC would continue to go into Sinbad Gully once a month to check and re-set traps and monitor possum densities, and at this stage had no plans to release any more Kiwi into the area. “If these Kiwi do breed, we’d let them do their own thing and hope we’ve done enough to protect the young chicks with the predator-trapping we have in place and the work we’ve all done over the past two years,” she said. Sinbad Gully was home in the 1970’s to the last known kakapo living on the mainland. The Sinbad Gully is located close to the head of Milford Sound within Fiordland National Park and the Te Wāhipounamu - South West New Zealand World Heritage Area. In 1974 Sinbad Gully was set apart as a ‘Special Area’ because of the presence of kakapo and the largely unmodified state of its vegetation. This status was lifted in 1992. Sinbad Gully is now classified as part of the ‘Eastern Remote Zone’ under the Fiordland National Park Management Plan (2007). The Sinbad Gully has a natural barrier of steep terrain, combined with a cold, wet climate which has limited the invasion of mammalian predators. These attributes have contributed to making it a safer refuge for rare lizard species such as the Sinbad and Mahogany skinks and the Cascade gecko. All three were only recently discovered in the Sinbad Gully and the Sinbad skink is known only to the Sinbad Gully. Other species present include rock wren, kea, whio, kiwi, weka, large weta and other large colourful invertebrates. The valley was also one of the last refuges of kakapo in Fiordland. Animal pests have had a serious impact on native wildlife through direct predation and competition for food. The valley walls surrounding the Sinbad Gully form a natural barrier limiting the re-invasion of introduced predators. 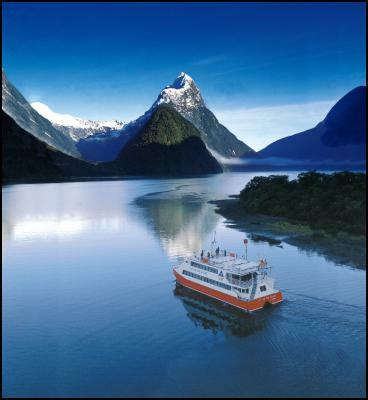 Southern Discoveries is the oldest and most well-established operator in Milford Sound, taking in unique wildlife, tumbling waterfalls and the towering beauty and majesty of Mitre Peak on cruises run on a fleet of modern, comfortable boats. Southern Discoveries is unique in operating the Milford Discovery Centre incorporating Milford Deep, New Zealand’s only floating underwater observatory. Find more from Southern Discoveries on InfoPages.